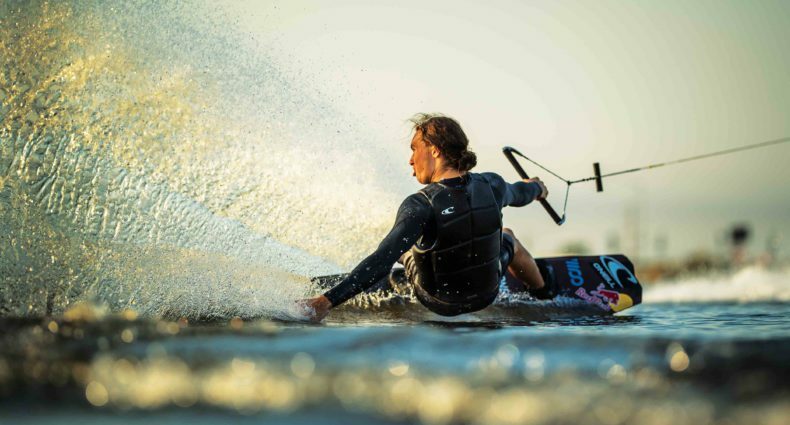 Do: A wide approach gives you more time to have a nice progressive edge into the wake. The wider you start, the more time you have to build up speed to carry your trick into the flats. Do: Make sure you keep the handle in tight with both hands and keep it close all the way up to the peak of your air. Don’t: Yank the handle, you will break the tension and won’t be able to maximize your hang time. Do: Keep the handle to your lower back, and peek over your leading shoulder (my left) to spot the boat. Don’t: Look at your feet or water, it makes it harder to see where you are going. Do: Bring your knees up as soon as you have completed the handle pass to get the grab. Don’t: Look down and start reaching for your board, you will most likely loop out and want to abort the landing. Do: Keep that front arm leading your hips to maintain the tension; then you can poke and hold your grab until putting her down. Don’t: Let your arm out, you will lose control and make landing in the flats more difficult than it should be.